In 1973, Buick entered the compact field with the Apollo. a 3-door hatchback “coupe”. The rear deck and the rear window was a one-piece tailgate that lifts to an inside cargo carrying space of more than 27 cubic feet. However, with its rear seat in its regular position there’s comfortable seating for three people and no evidence of a tailgate. This newest vehicle of the Buick line offered many of the brand’s regular features, including an optional combination of the 350 cubic inch V8 engine and three speed Turbo-Hydra-matic transmission used in Buick’s intermediate and full-sized cars. 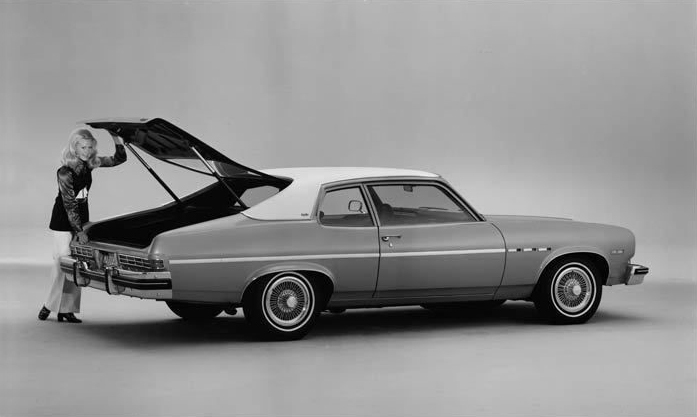 Styling was also in keeping with the 1973 Buick line, even including the smart ventiports. Published on October 22, 2013 10:20 am.